LELAND — A haze hangs over the Mississippi Delta in the summertime, and fields of cotton and soybeans zip by the car window like the edge of a roulette wheel, creating pleasant monotony. Just east of Greenville is Leland, an immaculate, quiet little town where every man knows his neighbor and stores still close on Wednesday afternoons. 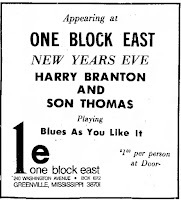 Its also a place where the 'old time' blues have survived in the homes and juke-joints just the other side of the Southern railroad tracks. 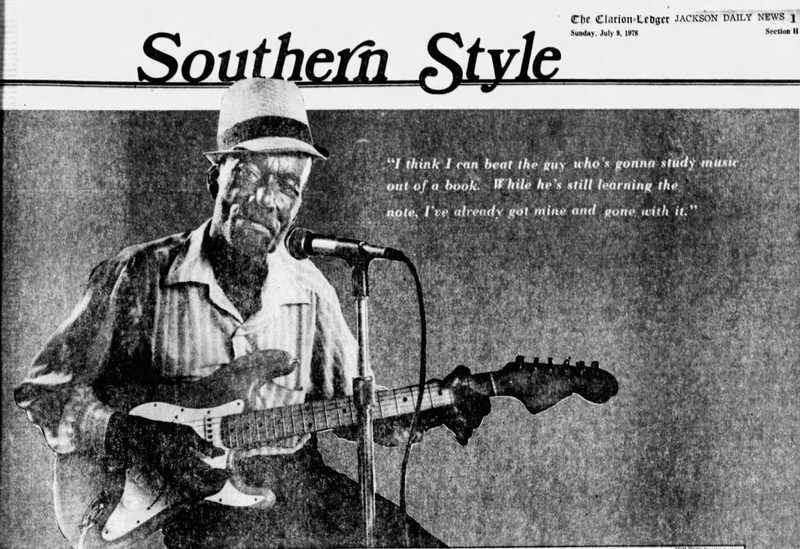 Blues singer James`Son' Thomas lives there, on Stone Street, in a.3- room shotgun house with a half-screened-in front porch and a '66 Ford parked out front. An old tire lies forgotten in the yard, and candy wrappers are wedged into the cracks of the well-worn wooden doorsteps. Inside, a floor fan cuts through stale, 98-degree air, and a hint of a breeze pushes past the flowered, plastic curtains.Everything that's of any value to Thomas is nailed to the paneled walls of his front room, along with portraits and snapshots of family and friends. The photographs that don't fit on the walls are stuffed into a cardboard box under the bedside table. A fishing pole is propped next to Thomas' electric guitar on the greenlinolium floor, and a sculpted head, with a gold tooth in its mouth, is on a nearby table. Besides being a blues singer, Thomas is also a talented sculptor and "goes to the hills" when he gets the whim to bring back a supply of Yazoo Clay. The gold tooth came out of Luddie Randolph's mouth. She's his third wife. 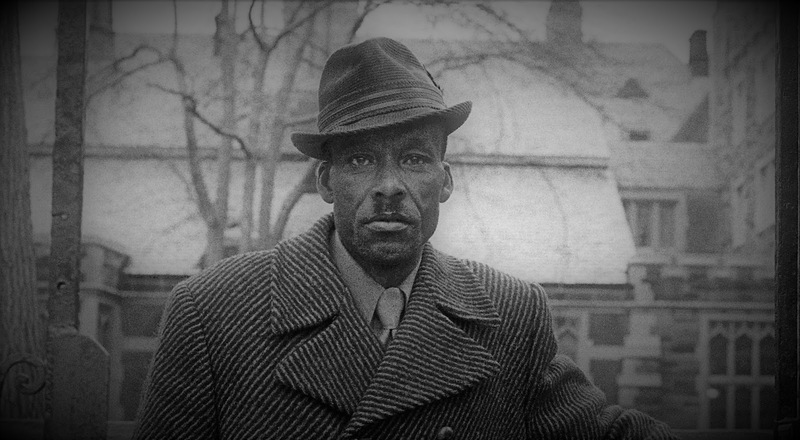 His first Wife left him —gave him the blues, he says — and the second one threw him out with his clothes. "I'm gonna put that tooth in a better head when I make some money," says Thomas. Its probably accurate to say that Thomas' place hasn't changed much over the years, not even since he became a celebrity of sorts back in the late 1960s, when he first shook hands with Bill Ferris. 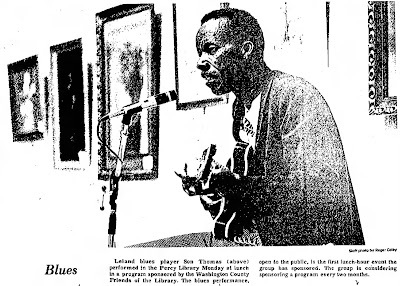 Ferris, who researched and wrote the book "Blues in the Delta," wasn't interested so much in making Thomas a celebrity; just in making him a living example of a blues musician who was born, raised and probably will die some-where in the rich Delta countryside. Thomas, along with other musicians such as 'Sonny Boy' Watson, the late Poppa Jazz and 'Little Son' Jefferson, is mentioned frequently in Ferris' book. And as a result of their friendship, Thomas has has re-corded several albums, appeared on the NBC Today Show, educational television and on documentary films about Southern culture. He's also been a 'visiting professor of music' at places such as Yale University, and the Universities of Connecticut, Indiana, Arkansas and Delaware. It doesn't matter that he never got past the fifth grade at the Morning Star church school in Eden, or that he only plays music by ear. "I think I can beat the guy who's gonna study music out of a book," says Thomas. ''While he's still learning the note, I've already got mine and gone with it." "What's interesting to me is to see musicians like James Thomas move in different worlds," says Ferris. "I first met him in his world, but since then he's been to the Smithsonian Festival, Yale, Jackson State University, and featured on the Today Show. He's al-ways completely at ease, relaxed and unimpressed by the whole fan-fare. He seems to grow through all these experiences. To me, that says something about the fact that he is an artist." Thomas is a wiry man with a pack of Camel cigarettes in his front pocket and a Miller beer in one hand. "Ain't but one thing make me nervous," he says, grinning, "and that's when I see I ain't gonna make no money. I reckon all that corn whiskey I used to drink gave me nerve." Although Thomas had never been any farther away than Tennessee before he met Ferris, traveling to faraway cities by plane and bus doesn't bother him much. "I done got use to it now, cause a met so many people." He was•born 52 years ago in Yazoo County and lived there on his grandparent's farm until 1961, when he moved to Leland. "They always told me that if I moved to town, I'd starve to death. But I made so many crops and didn't make no money I told them I'd move to town and ,eat out of the garbage can, if I had to." There are lots of blue singers in the Mississippi Delta, just like Thomas, who have preserved their black tradition. And nearly all of them are men. In the rural areas, there weren't many women into the blues," says Ferris. One of the reasons is that it was very dangerous. At times fights would break out and a man could handle himself a little better in situations like that. But I'm only guessing. "I think there are some folk traditions where the men are the primary people. Like in Africa, the "griot" is the singer of tales. They're the people who carry the worlds of tradition, the laws, the music and history verbally, orally. It's those people who told (Alex) Haley (the author of 'Roots') where his family had come from These are almost always men," Ferris says. "I think in some ways the blues musicians may be a connection to that world, lie adds. Thomas' uncle taught him to sing the blues and play guitar on a $8.50 Gene Autry model he ordered from Sears and Roebuck. "When I learned how to play better than him, he made me put it up." he says. laughing. He used to pick up verses from blues records or from Grand Ole Opry broadcasts and add some of his own verses to them, singing them in places like the Elk's Home or on Sharp Street in Cleveland. 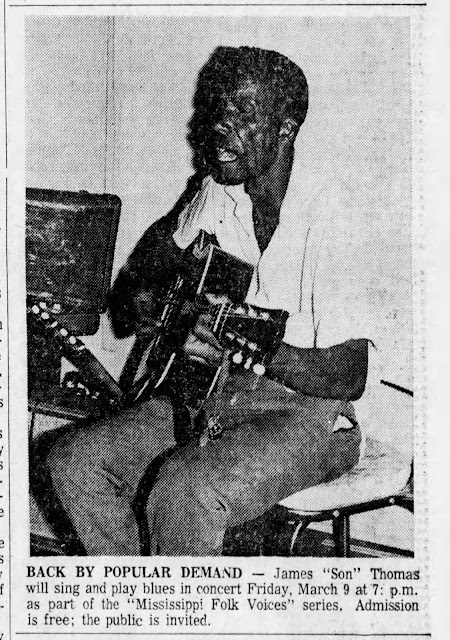 He remembers playing guitar once in a nightclub with blues singer Little Milton. That night, a man got stabbed in the head. and Thomas says he got blood all over a new brown suit. The blues "gave him ease," when he tried to make a living by digging graves, carrying white men their breakfasts or chopping cotton. "When people is in the fields chopping cotton, you hear them singing the blues, 'cause that's the only thing that makes 'em feel good," says Thomas. "The blues come to you when you're playing music. The young people, they love this swing type music." 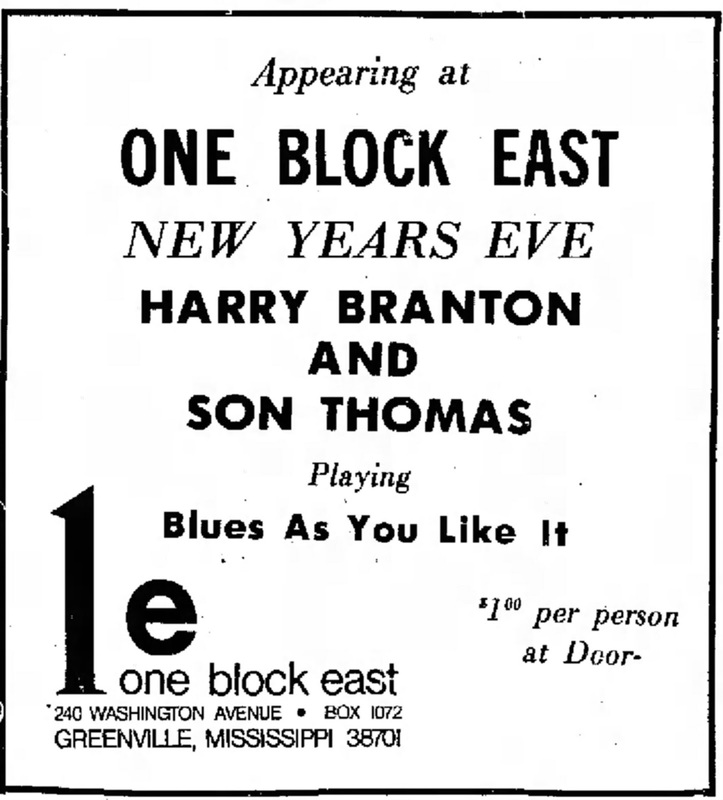 The blues have changed a lot since Thomas was a boy, although he says he's beginning to see a revival of sorts, especially by white musicians. Nowadays, he says, when they have a dance in one of the black clubs, "you can't hardly get in for all the white people." But this blues singer still clings to the old time blues, the way he knew them when he was a child. He's sad to see all his old friends die, like Poppa Jazz. All the men in the neighborhood use to meet at his house every day at 4 p.m., to visit, tell stories and sing songs. With little persuasion, Thomas drags a ladder-back chair off the front porch, puts on a favorite straw hat, and tunes his electric guitar. Then he takes one more swig from his beer, taps his heel and sings what comes natural — "Beef steak when I'm hungry. Whiskey, when I'm dry. Goodlookin' women while's I'm livin'. Heaven, when I die." "Now," he says, winking. "You can't beat that."